Great for everyday wear. Perfect for the horse lover in your family. 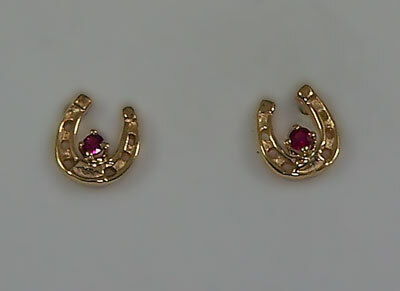 Ruby Horseshoe Earrings set with genuine Ruby. Offering a full three dimensional cast design. Be sure to check out this new design in a wide array of metals and stone combinations. Set with .04 ct of genuine Ruby. Have it your way with any style birthstones you choose. Simply fill out the request form below to design your own pair of horse shoe earrings today.